With spring in full swing and summer around the corner, I love sporting fun pastel shades to accompany the warmer weather. This Sira & Mara bracelet is the perfect touch to this outfit and many others I have planned for the upcoming weeks. I love that it makes a statement on its own or with your day-to-day arm party. Cute skirt! Can't believe it's from f21! Need to check that out. love the combination of stripes and florals. That skirt is so cute! Gorgeous skirt and shoes - nice combination! I can't believe that fab skirt is from Forever21!! Such a find. Love it paired with the striped tee. LOVING the hair! va va voom!!! I love that skirt!! So fun and can easily transition between any season! Florals and stripes are a fave of mine! THIS IS THE BOMB. Why are you the abs cutest everyday?? Could be casual or dressy. Looks great! Oh I hope we have that skirt in the UK! Can't believe that skirt is from Forever 21!! What a great find! I love it! 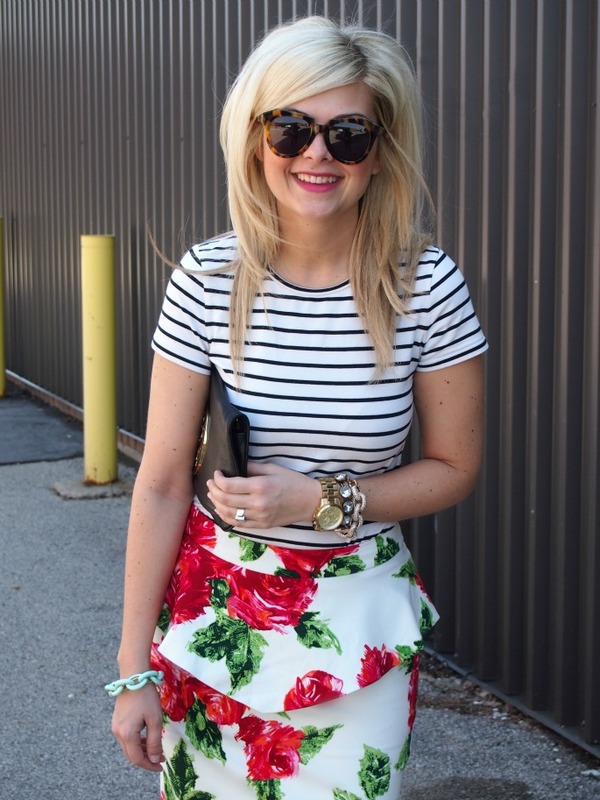 stripes + florals are great - love the way you paired this! What a cute skirt. I really like how you mixed stripes & floral. Insane combo! Oh my! That skirt is just gorgeous and I love stripes and florals together. You look fabulous! I love stripes and florals together. And I LOVE that floral peplum skirt. So so cute! LOVE this mix - and that peplum skirt is perfection! This look is so chic! I love that the skirt is from Forever 21. What a great piece! Mixed print perfection. So cute! Such a cute skirt! Love it with the striped top! will you do a hair tutorial? thanks! Still totally in love with your hair! Great skirt - it fits you perfectly. And I love that Tory Burch clutch - such a classic! That skirt is such an awesome F21 find! It's gorgeous! Sooo cute. Love your hair too. So jealous of it. I cannot believe that skirt is Forever21! I need to have it. Great find & even better ensemble! Floral and stripes are a great combo! LOVE this look so much--the skirt looks amazing, I bet Forever21 will be selling out any second now! And the shoes look like a low heel, will have to check those out too. This outfit is perfection! I love florals and stripes. You look amazing girl! XO! so fresh! The peplum is perfection pretty lady! Striking combination of stripes and floral. Love the colors! The red shoes are amazing! So cute! Love the color mix! !